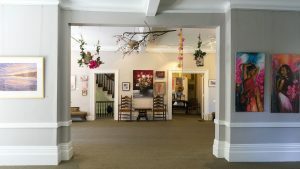 PHOTO BY NEILAND BRISSENDEN/GLEANER NEWS: The Women’s Art Association of Canada has called 23 Prince Arthur Ave. home since 1916. 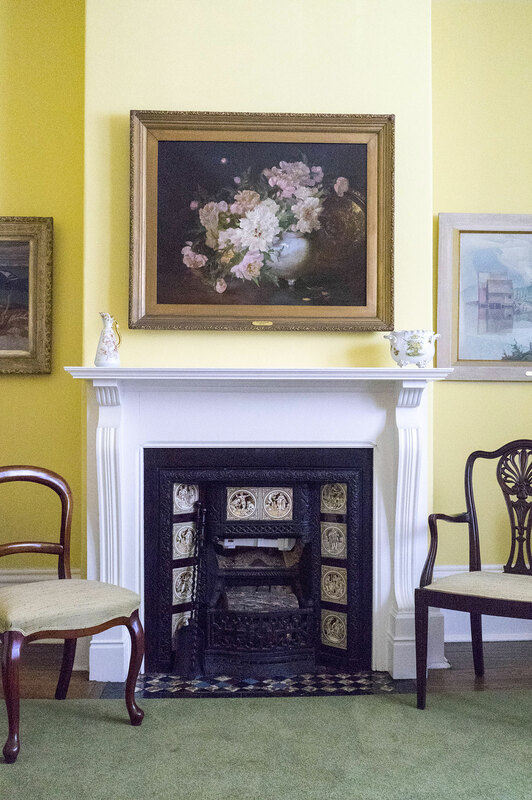 A gem in the heart of the Annex, features of the nineteenth-century house include an art-filled president’s room, where founder Mary Dignam’s 1893 Peonies hangs in pride of place above the fireplace. At a time when women had neither the right to vote nor access to much education, Mary Ella Dignam founded the Women’s Art Association of Canada (WAAC). By all accounts a singular woman with a singular vision, Dignam wanted the association to be a place that nurtured a love of art, promoted Canadian artists at home and abroad, and provided support for artists when they needed it. 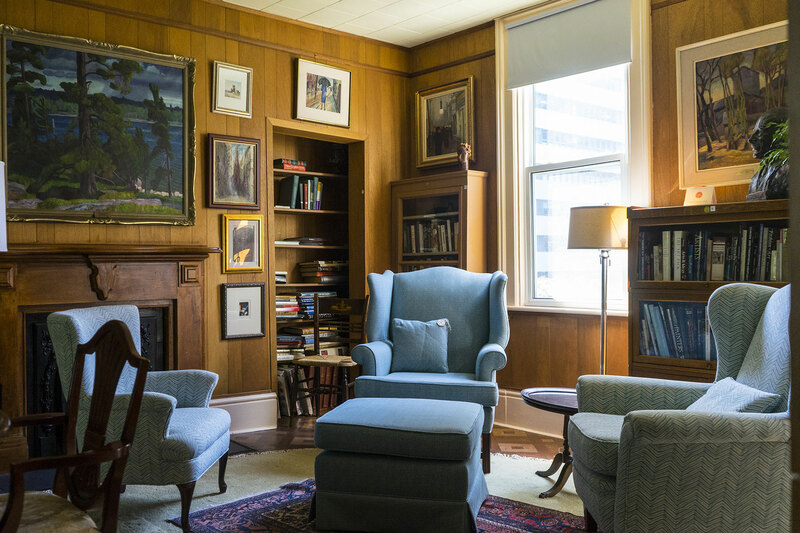 One hundred and thirty years later, the association remains true to this vision, and is still going strong from its home on Prince Arthur Avenue. PHOTO BY NEILAND BRISSENDEN/GLEANER NEWS: The library leads to the studios for artists and an apartment. Within a few years, the association had a thriving membership and a place for what Butterill called the “tremendous amount of unexpressed and unexplored talent”. Butterill and past president Barbara Mitchell attribute the association’s early success to Dignam’s ability to cultivate relationships with a wide range of people. She had close friendships with the Group of Seven, who included artists from the association in their shows in the 1920s. Emily Carr, who only came to Toronto twice (in 1927 and 1935), visited the association both times. Dignam also had a close relationship with Lady Aberdeen, who founded the National Council of Women in 1893, and would become the association’s first patron. “Dignam saw a role for women in society and wanted to pave the way for that,” said Butterill. In many ways a woman ahead her time, Dignam wasn’t afraid to be different. She had an unconventional marriage, and would frequently leave her husband at home to provide income for her family. She would take young girls from Ontario on a grand tour of Europe, and had friendships with prominent members of Toronto society. Early membership rolls read like a who’s who of Toronto society, and include names like Osler, Eaton, Gooderham, and Austin, many of whom would attend one of the association’s most popular events: the annual garden party. 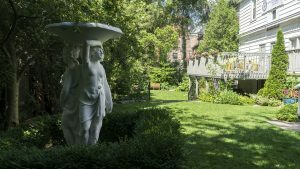 PHOTO BY NEILAND BRISSENDEN/GLEANER NEWS: The association’s annual garden party — once the highlight of Toronto’s social calendar — is held in the backyard. The annual party is still a highlight of the association’s calendar, with this year’s event — the 101st — celebrating the association’s 130 years. These days, the association’s mandate remains much as it was: support women in the arts, support students in the arts, and provide public education. 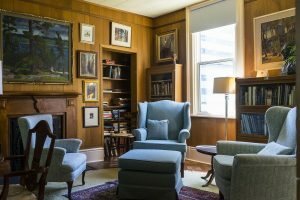 The association hosts regular lectures — its Wednesday night lecture series goes back 120 years — and has a lending library. It provides 14 scholarships at six institutions: OCAD University, Sheridan College Art & Art History, Royal Conservatory of Music – Glenn Gould School, The University of Toronto Faculty of Music, Canada’s National Ballet School, and the George Brown Theatre School. Scholarship recipients receive a one-year membership in the association in conjunction with their award. Michelle Langille was a George Brown scholarship winner in 2012, and has remained a member ever since. She said the scholarship gave her some much needed financial freedom, particularly because as a mature student, there were fewer scholarship opportunities open to her. Langille describes the organization as a pretty interesting one that has been around for a very long time. The house on Prince Arthur, which the association has owned since 1916, rents out 12 studios to its members. It also provides gallery space for exhibitions, and has one apartment that it rents out to an artist. PHOTO BY NEILAND BRISSENDEN/GLEANER NEWS: The building also includes a gallery space for exhibitions. The association currently has 210 members, ranging in age from adolescence to just shy of 100, and, of late, has focused more on engaging with the community. This year, 800 people toured the space during Doors Open Toronto. Membership is on the rise — social media has made a big difference, noted Butterill — and new members are finding their way to the association’s door. The membership is adapting, Butterill said, with a view to surviving for another 130 years. They have a 131 and beyond committee made up of younger women exploring how the club needs to adapt, a group the president described as very dynamic, well organized, and connected. “We’re very conscious and aware of the need to think about what the future looks like,” said committee member Langille, adding that she’s confident about the association’s prospects. Thank you Annex Gleaner for an excellent and comprehensive article on the history and current position of our wonderful historic association, the WAAC. The photos reflect the beauty of our 1874 building and cover all the relevant historical points of our story. The perfect coverage in all ways to celebrate our 130th anniversary. One small point – unfortunately Emily Carr could not actually travel from Victoria to attend her solo show in our building in 1935, but it was a great success and got a rave review in Saturday Night.